If you live in South Florida you know we enjoy terrific weather all year. Many living in the South Florida area have docks, and if you do, you’ll need dock accessories. There are certain accessories that are optional such as fish cleaning tables for those who enjoy fishing, but if you have a boat you’ll need dock cleats and dock fenders to protect your boat and dock. At Keys Deck & Dock Supply we have all the dock accessories you’ll need. What kind of accessories go with my dock? There are many different dock accessories depending on what you and your family like to do on the water. If you have a boat getting dock fenders is important to protect both your dock and your boat. At Keys Deck & Dock Supply our FEND-OFF Dock Fenders are some of the best available. The outer shell of our FEND-OFF Dock Fenders are made from flexible PVC to best protect your dock and boat. 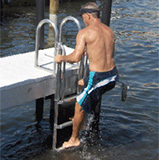 You’ll also want to get an aluminum ladder to make it easy to get in and out of the water. Dock cleats are also needed to tie your boat. We have three different sizes that come in 10”, 12”, and 15”. What kind of dock is best for me? There are many different advantages to having a PVC deck over and outdated wood dock. While wood docks can get slippery when wet, your new PVC dock is slip resistant. It also withstands heat so you’ll no longer have to worry about burning your feet when you walk out on your dock. PVC docks are mold and mildew resistant because they are made from plastic, unlike wood docks that can get mold and mildew if not taken care of. If you live in South Florida you’re lucky to enjoy some of the best weather in the country. Many of us move down here for the great weather and because we love the water. If you have a dock and a boat there are a few things that you’ll need in order to protect your boat and dock. Don’t settle for anything less than the best. Call Keys Deck & Dock Supply today or visit our website to see our great selection of dock accessories we have available. Our professionals will help get you set up with everything you need.